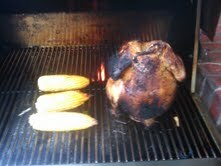 Yes, this is a post labeled as dinner for two and yes, there are 3 ears of corn in the picture. I had a house guest this week, so all dinners were for 3. The boyfriend and I usually have this meal for the two of us, and then there are leftovers for later in the week so I knew we could stretch it to a dinner for 3 with an extra ear of corn. It totally worked out and there was still some leftover chicken, so watch out for a chicken salad recipe later in the week. 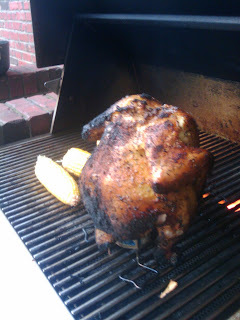 From my grill where beer makes everything better…I hope you enjoy! Mix garlic powder, herbs, cayenne, and salt/pepper in a small bowl. Take one sip of the beer and place can in roaster, then wash and dry chicken and set atop the beer/roaster so that the can is inside the chicken cavity. Removing the one sip of beer keeps it from boiling over. Rub the dry ingredients all over the chicken, cover and let sit in the fridge at least an hour up to over night. Preheat grill to 375 degrees, place chicken over indirect heat and grill about 45 minutes to an hour, until the juices run clear or a meat thermometer reads 165 degrees. Let cool at least 10 minutes before carving and discard beer. Pull back the husks, remove the strings and then rub butter over corn cobs until covered and then pull the husks back down over the ears of corn. Grill for 10 minutes in husk, and then pull back husk and gill for an additional 5 minutes to get those pretty grill marks. Top ears with more butter once on serving platter and enjoy. Special Equipment Note: I have a roaster similar to the one I linked over to, you can see the feet of it in the picture. This stand up contraption makes it much easier to grill this chicken; I am not sure where mine came from, but I am very appreciative to the friends who gave it to me! One evening I was trying to grill one without the roaster and was rigging it with some wire coat hangers and burning my arms, which was comical to watch but not fun to experience. So, it is possible to balance the chicken on a can without the holder, but it takes patience and maybe some MacGyver skills…I really recommend the holder as it makes things much easier! Thanks Nate and Charlotte! It was frickin' great. And as I am sure Lainey will point out, I....Marc Felice, didn't know what the stand up contraption was at first. Thanks Marc! You are a great house guest and an even better friend!